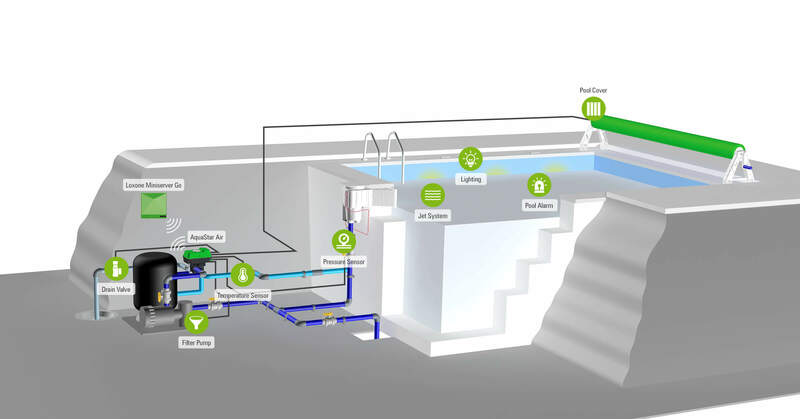 The Loxone AquaStar Air is the most modern 6-way backwash valve in the world and, in combination with the Loxone Miniserver or Miniserver Go, it makes it possible for the first time to add a fully automated, intelligent pool control system to your Loxone Smart Home. The 6-way AquaStar Air backwash valve connects wirelessly to the Loxone Miniserver or Loxone Miniserver Go, integrating it into your Loxone Smart Home. 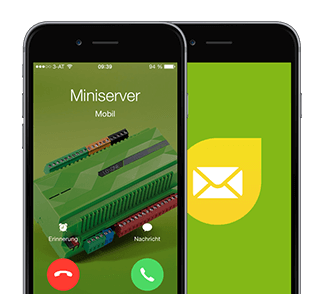 The Miniserver is at the heart of the operation, providing intelligent pool control, monitoring and automation as well as making it simple to set up. The convenience of the fully automated control system means that you get more time to enjoy your pool! Whether you are using your PC’s browser or are out and about using your mobile device, you can keep an eye on your pool from anywhere. At any time, you can control and monitor the water temperature, water level, filter times, pool cover, jet system and other features. The functionality of the new Loxone AquaStar Air ensures that your pool has the very best water quality. Its functions include filtration, backwash, rinse, circulation, waste, winter position and ‘closed’. The water drawn in by the pump is filtered through sand, which removes dirt particles. The cleaned water then goes to the inlet. This process involves reversing the flow of water so that the water presses into the sand from below. This removes the dirt, which is then rinsed out into the wastewater connection. This is activated after backwashing to ensure that the dirt does not make its way back into the pool. The sand resettles and a small quantity of water is drained via the wastewater connection. During circulation, the unit bypasses the filter, simply pumping the water back into the pool. The ‘waste’ function drains the pool at the end of the season. On this setting, none of the channels are open. 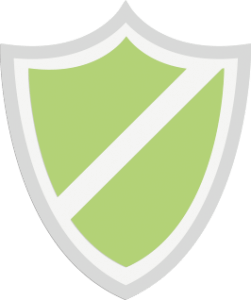 Get notifications from your Smart Home when various events occur e.g. when it is time for a service, when a threshold value has been reached or when the pool cover has been opened in your absence. You can decide what kind of notifications to receive, whether by e-mail, phone call, a flashing light etc. Loxone AquaStar Air is kitted out with numerous interfaces to allow for a comprehensive pool control system – you can control everything to do with your pool! 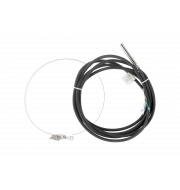 The AquaStar features a 1-wire interface, so you have the option of adding low-cost 1-wire temperature sensors. 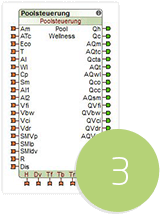 There are also three relay outputs that can be used as you choose for lighting controls, heat pumps, jet systems, and more. The AquaStar Air has its own terminal to allow connection to a filter pump as well as a safety valve for the drain. With the Loxone Miniserver, you can add more smart options to your pool. You could, for example, integrate a spa jet system, pool and garden lighting or a pool cover. These can all be integrated into the existing Loxone system. The Loxone Miniserver is the central, intelligent unit at the heart of your Loxone Smart Home system. It brings together the controls for shading, lighting, heating and other features, taking them off your hands. Because of Loxone’s Air technology, you can easily integrate the Loxone AquaStar Air into your Loxone Smart Home and fully automate your pool controls. Even existing pool systems can be integrated without a problem. 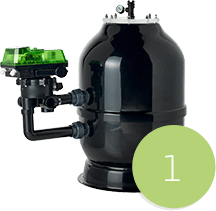 The Loxone AquaStar can be installed – and even retrofitted – with all well-known filter brands. Once it has been hooked up to a power supply, it is ready for action and can be linked up with the Loxone Miniserver. 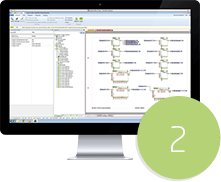 Then it is time to use Loxone’s free Config software to connect and configure your unit. The AquaStar will appear in the search results window and will be added. The ‘pool’ pre-set function block makes it easy and quick to configure pump periods, threshold values, filter programs, temperature monitoring and much more. The ‘pool’ software function block also includes an automatically-generated visualisation that you can use to remotely monitor and control your pool. To do this, you can either use your web browser or make use of the free iPhone and Android apps. The Loxone AquaStar Air was developed in partnership with Peraqua, the complete equipment provider for all types of pools, based in Austria. 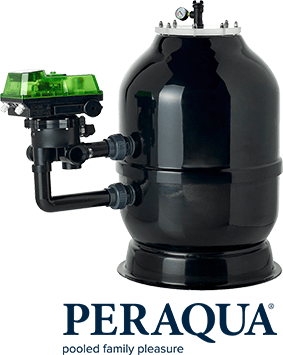 This guarantees the highest level of compatibility with Peraqua products such as Ocean V6 sand filters. 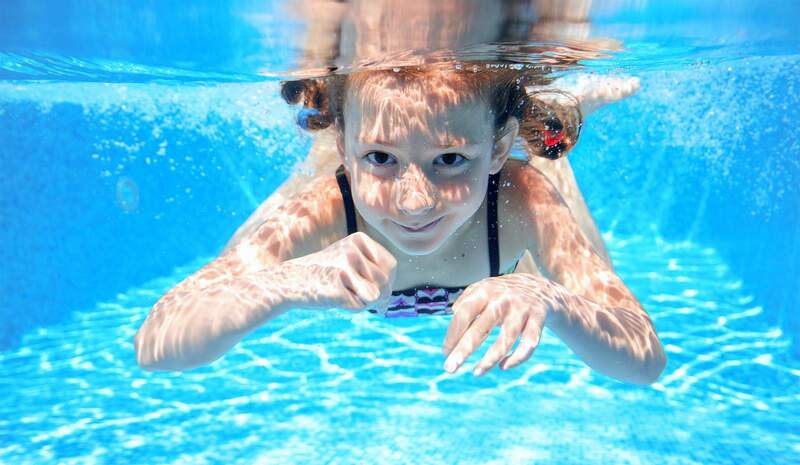 Peraqua has a wide range of accessories on offer for your pool.